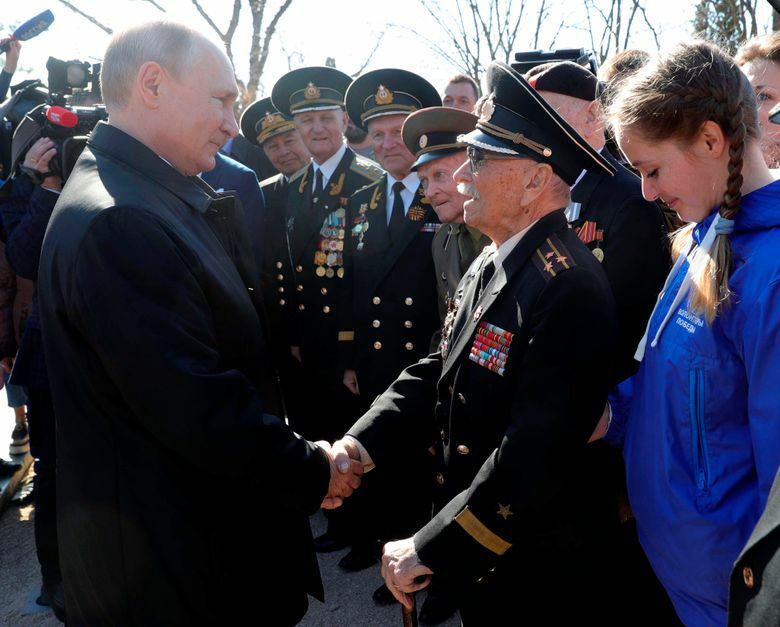 MOSCOW (AP) — President Vladimir Putin led thousands to chant “Russia!” on a visit Monday to Crimea marking the fifth anniversary of the Black Sea peninsula’s annexation from Ukraine, as NATO and the European Union once again strongly condemned the land grab by Russia. 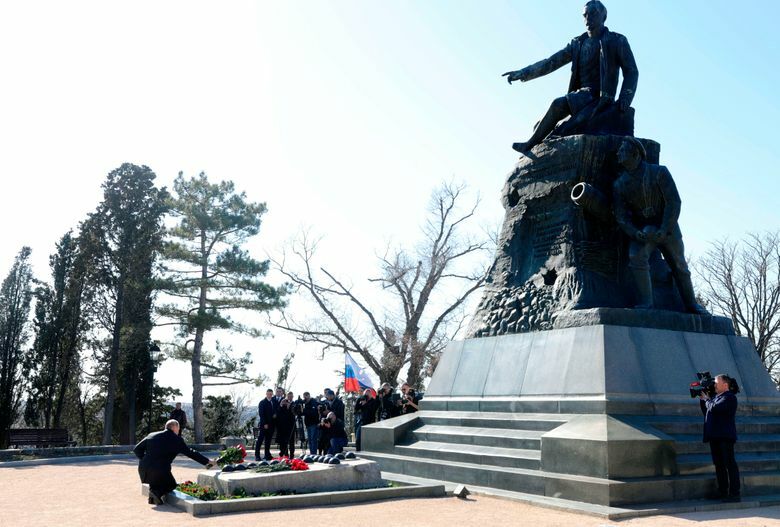 Speaking at an outdoor concert in Crimea’s regional capital of Simferopol, the Russian leader hailed Crimea’s residents, likening them to the Red Army soldiers of World War II. 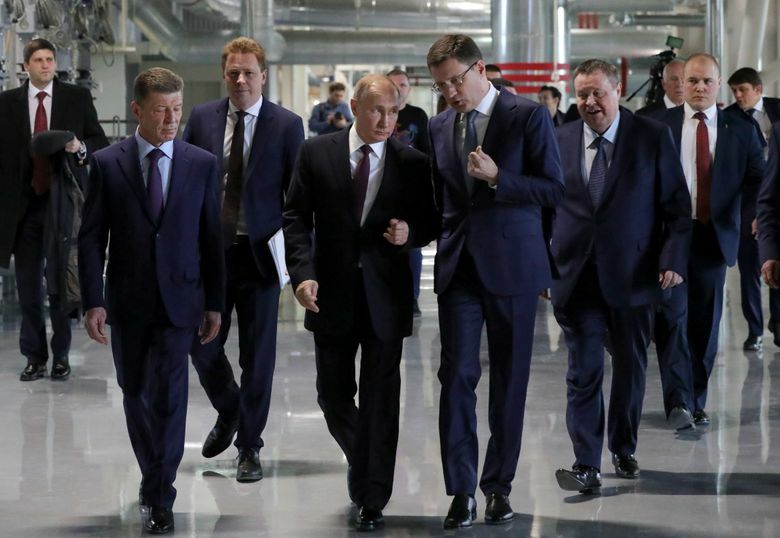 Putin began his trip by attending the launch of new power plants in Crimea, part of Moscow’s efforts to upgrade the region’s infrastructure. Ukraine has cut off energy supplies to the peninsula and blocked shipments of Crimea-bound cargo via its territory after Moscow annexed the region in 2014. “The situation has changed radically,” Putin said, adding that the new power facilities will fully cover Crimea’s energy needs. Russia’s modernization effort for Crimea has included building a 19-kilometer (11.8-mile) bridge that opened last year across the Kerch Strait, which links the Black Sea and the Sea of Azov. The $3.6-billion project gave Crimea a land link to Russia. Previously, a ferry crossing that was often interrupted by gales served as the only connection. Moscow’s annexation of Crimea drew U.S. and EU sanctions against Russia that hurt its economy, but the move boosted Putin’s popularity at home. NATO allies said in a statement Monday that “we strongly condemn this act, which we do not and will not recognize.” They denounced alleged rights abuses including “arbitrary detentions, arrest, and torture” against members of the Crimean Tartar community and criticized Russia’s military buildup in Crimea. Russia has beefed up its military in Crimea with new navy ships, missiles and warplanes. Viktor Bondarev, the head of the Russian upper house’s defense affairs committee, said the new weapons included Iskander-M missiles and Tu-22M3 long-range bombers. NATO and the EU also called for the release of Ukrainian seamen who were seized by Russia in November’s standoff in the Black Sea. 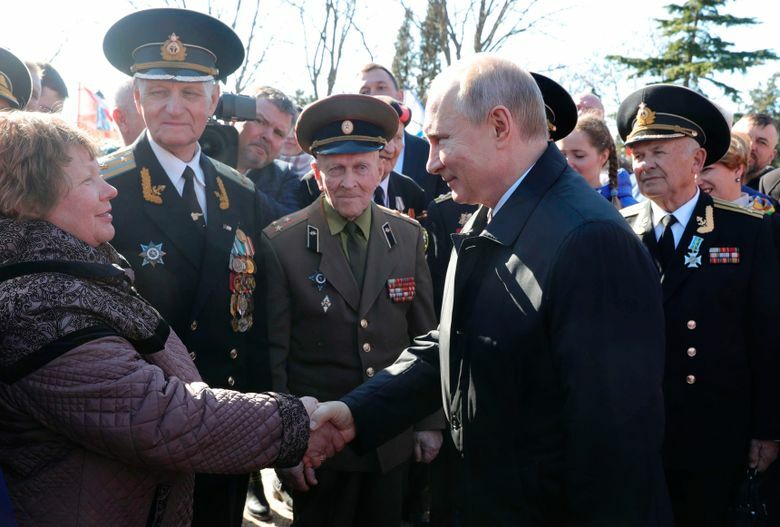 Putin claims Russia “re-integrated” Crimea after the ouster of Ukraine’s former pro-Russian president in 2014 to protect ethnic Russians who made up the majority of Crimea’s population from Ukrainian nationalists. The Kremlin was also worried a new Ukrainian government could annul Russia’s lease on its key Black Sea navy base in Crimea and welcome NATO there instead. 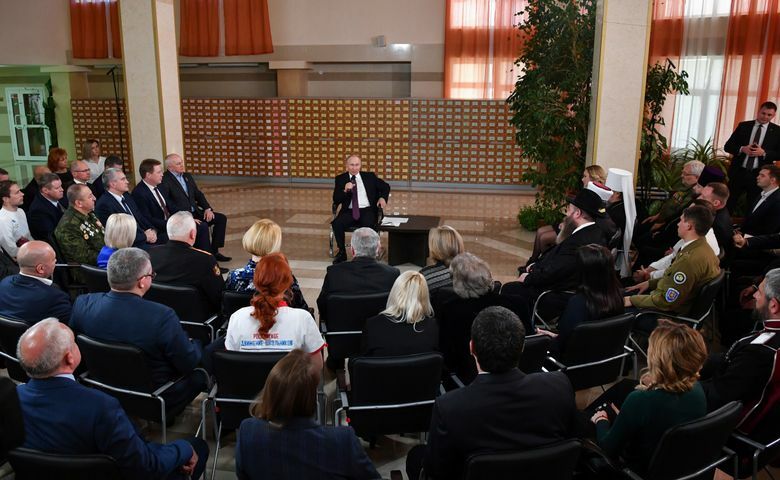 The Russian leader has said he put Russia’s nuclear forces on combat readiness during the 2014 developments in Crimea and warned his Western counterparts that Moscow was ready to defend what it considered its land. The annexation gave Russia hundreds of miles of coastline along the Black Sea, a near-stranglehold on commerce in the Sea of Azov and access to vast potential energy riches on the Black Sea shelf. Crimea was first seized by Russian forces in the 18th century under Catherine the Great. The 27,000-square kilometer (10,425-square mile) territory, roughly the size of Massachusetts, is a lush peninsula that long has been a favorite vacation destination for Russians. It became part of Ukraine in 1954 when Soviet leader Nikita Khrushchev transferred jurisdiction from Russia, a move that was a mere formality until the 1991 collapse of the Soviet Union meant that Crimea landed in an independent Ukraine. The Kremlin has argued that Khrushchev’s move on Crimea violated Soviet law. Russian troops swept into Crimea just days after the February 2014 ouster of Ukraine’s Russia-friendly president, catching the West by surprise. The Russian forces blocked Ukrainian soldiers at their garrisons, setting the stage for a hastily called referendum in Crimea that the West denounced as illegitimate. During a meeting with residents that involved religious leaders, Putin said he had invited Turkish President Recep Tayyip Erdogan to attend the opening of a new mosque in the region and suggested also inviting Israeli Prime Minister Benjamin Netanyahu to visit for a ceremony unveiling a new synagogue. The U.S. and the EU responded to the annexation of Crimea and Moscow’s support for a separatist insurgency in eastern Ukraine with several waves of sanctions that have limited Russia’s access to global financial markets and to energy and defense technologies. Annexing Crimea helped bolster Putin’s popularity but public enthusiasm about the land grab has waned over the years amid Russia’s economic difficulties and a plunge in living standards. A poll this month by the Public Opinion Foundation, a Moscow-based survey firm, said most Russians continue to support the annexation, but also indicated an increasing public awareness of its costs. Associated Press writers Lorne Cook in Brussels and Edith M. Lederer at the United Nations contributed to this report.